Lawrence Olajuwon Timmons (born May 14, 1986) is an American football linebacker who is currently a free agent. He was drafted by the Pittsburgh Steelers in the first round of the 2007 NFL Draft. He would later win Super Bowl XLIII with the Steelers over the Arizona Cardinals. He played college football at Florida State. Timmons was drafted by the Pittsburgh Steelers 15th overall in the 2007 NFL Draft. He began his rookie season as the backup right outside linebacker to James Harrison. He made his professional debut in the Steelers' season opener against the Cleveland Browns, making one tackle in the Steelers' victory. The following week, he made a season-high two solo tackles during a 26–3 victory over the Buffalo Bills. As a rookie, he was used rarely as a rotational player and on special teams but appeared in all 16 regular-season contests. He made 13 tackles throughout his rookie season. The following season, he was moved over to right inside linebacker, backing up veteran Larry Foote on a Steelers defensive linebacking corps with veteran depth and talent that included himself, Foote, Harrison, LaMarr Woodley, and James Farrior. In the season opener, he made four solo tackles in a 38–17 victory over the Houston Texans. On September 29, 2008, Timmons made four combined tackles, a pass deflection, and sacked Baltimore Ravens' quarterback Joe Flacco for his first career sack as the Steelers defeated them, 23–20, in overtime on Monday Night Football. In Week 7, he had his best game of the season statistically, finishing with a season-high ten combined tackles and had a season-high two sacks after getting to Bengals' quarterback Ryan Fitzpatrick twice during the Steelers' 38–10 victory. 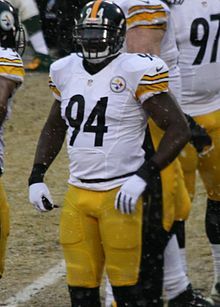 On November 3, 2008, Timmons earned his first career start during a victory over the Washington Redskins during Monday Night Football and finished the game with four combined tackles. On November 30, he made four tackles and intercepted Patriots's quarterback Matt Cassel for his first career interception during the Steelers' 33–10 victory. On January 11, 2009, he played in his first career playoff game when the Steelers defeated the San Diego Chargers, 35–24, in the wildcard round. He finished the game with six combined tackles, three of them being solo. The Steelers defeated the Baltimore Ravens in the AFC Championship and went on to play the Arizona Cardinals in Super Bowl XLIII. In his first Super Bowl, Timmons recorded five tackle, helping his team win, 27–23. He finished his second season with 65 tackles, five sacks and an interception, while starting three games and playing in all 16 regular-season contests. Timmons took over as starter for the 2009 season following the release of Larry Foote, who asked for his release, foreseeing Timmons's future emergence as the starter and increased playing time. Timmons was slated as the Steelers' starting right inside linebacker to begin the season but missed the season opener against the Tennessee Titans. He returned the following week, making three solo tackles and two pass deflections during a 14–17 loss to the Chicago Bears. The next game, he made his first start of the season during a loss to the Bengals and finished the game with three combined tackles and a pass deflection. During Week 5, Timmons made five tackles and forced two fumbles as the Steelers routed the Cleveland Browns, 27–14. He finished the 2009 season with a total of 78 combined tackles, 7 sacks, 4 pass deflections, and 3 forced fumbles in 13 starts and 14 games. Timmons started the season opener against the Atlanta Falcons and finished the 15–9 victory with 11 tackles. The next week, he recorded a career-high 15 combined tackles (12 solo) and a forced fumble during a win over the Tennessee Titans. In 2010, he had a career year for the Steelers and finished off the season as the highest-rated inside linebacker by Pro Football Focus. He led the team with 135 tackles, and recorded 3 sacks, 9 pass deflections, 2 forced fumbles and 2 interceptions. The Steelers finished with the No. 1 run defense in the league, allowing only 63.2 yards per game. Timmons started 15 of the 16 regular season game, while playing in all of them. At the end of the 2010 season, Timmons and the Steelers appeared in Super Bowl XLV against the Green Bay Packers. He was a starter and had three total tackles in the 31–25 loss. On August 23, 2011, the Steelers gave Timmons a five-year, $47.79 million contract extension that included $11 million guaranteed and a signing bonus of $10 million for his performance throughout the 2010 NFL season. His rookie deal expired at the end of the 2010 season and he was a free agent; however, the Steelers signed him to an extension after the NFL lockout was resolved. In the season opener against the Ravens, he collected a season-high 12 tackles as the Steelers lost, 7–35. Timmons' numbers dropped from the previous season due to his moving from his normal inside linebacker position to outside linebacker, filling in for an injured James Harrison. He recorded 93 tackles, 2.0 sacks, 2 forced fumbles, and an interception. He started the season making five solo tackles in a 19–31 loss to the Denver Broncos. During a Week 6 contest against the Tennessee Titans, he made six total tackles and intercepted Titans quarterback Matt Hasselbeck for his first pick of the season. On November 25, 2016, Timmons racked up ten combined tackles and intercepted Brandon Weeden and scored a 52-yard touchdown for the first of his career. The Steelers went on to lose to the Browns 14–20. During Week 14, he made a season-high 11 solo tackles in a loss to the San Diego Chargers. He finished his sixth NFL season with a total of 106 tackles, 6.0 sacks, 2 forced fumbles and a career-high 3 interceptions. This was his first season starting all 16 regular season contests. On October 20, 2013, Timmons collected a season-high 17 tackles (12 solo) during a 17–13 victory over the Baltimore Ravens. In 2013, Timmons led the team with 126 tackles, 3.0 sacks, 2 interceptions, and a forced fumble. This was the second time in the last 3 years he led the team in tackles. He started all 16 games for the second consecutive year. On September 11, 2014, he made 12 total tackles during a 6–26 loss to the Baltimore Ravens. On October 20, Timmons made a season-high 11 solo tackles and an assisted tackle against the Houston Texans. During a Week 10 loss to the Jets, he collected a season-high 13 combined tackles. On December 21, 2014, Timmons tied his season-high of 13 combined tackles during a 20–12 victory over the Kansas City Chiefs. He had another excellent season and was recognized for it by being named to his first career Pro Bowl on December 23, 2014. On January 2, 2015, Lawrence Timmons was named Second-Team All-Pro for the first time of his career. He finished the 2014 season with 132 combined tackles, 87 solo tackles, and two sacks. He played in all 16 games for the third consecutive season. During Week 4 of the 2015 season, Timmons had a season-high 11 tackles and sacked Ravens quarterback Joe Flacco for his first of the season during a 20–23 loss to the Baltimore Ravens. On October 18, 2015, he had six combined tackles and intercepted Carson Palmer in a 25–13 defeat over the Arizona Cardinals. On January 3, 2016, he recorded ten combined tackles and a season-high 1.5 sacks in a 28–12 win over the Cleveland Browns. Timmons finished the season with 119 combined tackles, 77 solo tackle, one interception, and a forced fumble. The Pittsburgh Steelers finished the season 10–6 and received a playoff berth. On January 9, 2016, Timmons recorded four combined tackles in an 18–16 AFC Wildcard victory over the Cincinnati Bengals. On January 17, 2016, he made six combined tackles in a 23–16 divisional loss to the eventual Super Bowl champions, the Denver Broncos. On October 20, 2016, the Steelers lost to the New England Patriots and Timmons racked up a season-high 11 solo tackles during the game. In Week 11, Timmons recorded eight combined tackles and made his first sack of the season in a 24–9 victory over the Cleveland Browns. During Week 13, he made seven combined tackles and intercepted New York Giant's quarterback Eli Manning and returned it 58-yards. He finished the season with 114 combined tackles, 2.5 sacks, 5 pass deflections, two interceptions, and a forced fumble in 16 games and 16 starts. On January 8, 2017, Timmons recorded a team-leading 14 combined tackles and sacked quarterback Matt Moore twice in a 30–12 AFC Wild Card Round victory over the Miami Dolphins. On March 10, 2017, Timmons signed a two-year, $12 million contract with the Miami Dolphins. On September 19, 2017, the Dolphins suspended Timmons indefinitely after he went missing before the team's Week 2 match-up against the Los Angeles Chargers. It was revealed that Timmons was reported missing from the team's hotel in Los Angeles, and the Dolphins filed a missing persons report. Timmons was later found at the Los Angeles International Airport, but was headed to see his daughter who lives in Pennsylvania. On September 26, 2017, Timmons was reinstated by the team. On March 13, 2018, Timmons was released by the Dolphins. ^ State Championships (2003) – AAA Boys (Raw). Sc.milesplit.com. Retrieved on April 6, 2017. ^ Yahoo Sports: Rivals.com Ranking – Rivals.com Outside linebackers 2004. Sports.yahoo.com. Retrieved on April 6, 2017. ^ "Lawrence Timmons". databaseFootball.com. Archived from the original on November 3, 2012. Retrieved December 21, 2012. ^ a b c d e f g h i j "NFL Player Profile: Lawrence Timmons". NFL.com. Retrieved December 8, 2016. ^ "Ourlads.com: Pittsburgh Steeler's depth chart". ourlads.com. Retrieved December 8, 2016. ^ "Steelers to release veteran linebacker Foote". ESPN.com. April 28, 2009. Retrieved December 25, 2017. ^ "Sportrac.com: Lawrence Timmons contract". Retrieved December 8, 2016. ^ Steelers reward LB Lawrence Timmons Retrieved August 24, 2012. ^ "San Diego Chargers at Pittsburgh Steelers - December 9th, 2012". Pro-Football-Reference.com. Retrieved December 20, 2017. ^ "Baltimore Ravens at Pittsburgh Steelers - October 20th, 2013". Pro-Football-Reference.com. Retrieved December 20, 2017. ^ "Divisional Round - Pittsburgh Steelers at Denver Broncos - January 17th, 2016". Pro-Football-Reference.com. Retrieved December 20, 2017. ^ "Pittsburgh Steelers at Cleveland Browns - November 20th, 2016". Pro-Football-Reference.com. Retrieved December 20, 2017. ^ "Dolphins Sign Timmons and Allen". MiamiDolphins.com. March 10, 2017. ^ Orr, Conor (March 10, 2017). "Lawrence Timmons is headed to Miami Dolphins". NFL.com. ^ "Dolphins suspend LB Lawrence Timmons indefinitely". NFL.com. September 19, 2017. ^ Patra, Kevin (September 26, 2017). "Miami Dolphins reinstate LB Lawrence Timmons". NFL.com. ^ "Miami Dolphins Release Timmons". MiamiDolphins.com. March 13, 2018. ^ "Lawrence Timmons Stats". ESPN Internet Ventures. Retrieved March 5, 2014. ^ Despite lack of expertise, Timmons ready for BCB Retrieved August 24, 2012.